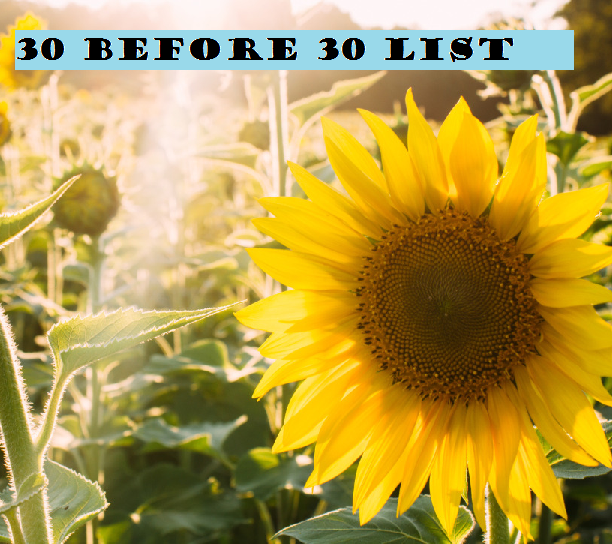 On my birthday I came upon a blog post of someone mentioning a “30 before 30 list.” It intrigued me because I had just turned 27 and I knew I could accomplish so much in a few years. I realize most people must be a year away from their thirtieth birthday to do this list but it seemed like I was meant to make one just for fun since I’d found the post on my actual birthday. 1. Complete a 5K run! 2. Complete a 10K run. 4. Two Cities Marathon in my hometown in November 2016. 5. Participate in a Color Run. 6. Participate in a Glow Run. 7. Boston Marathon (maybe) in 2017 or 2018. 8. Move back to California! 9. Run for a charity. 11. Make a full time income with my business so that I can be financially independent. 12. Go on a vacation just to work on my writing, particularly the books I want to write. 13. Publish my first eBook or printed book. 14. Travel to another country. 15. Visit at least one of the following for the first time: New York, Florida, Washington DC, and/or South Carolina. 16. Read through the whole Odd Thomas series by Dean Koontz. 17. Wear a sundress for the first time as an adult. 18. Get my driver’s license. 19. Buy my first car. 20. Travel in a superliner room on an Amtrak train (been a dream of mine for quite a while now). 21. Go up to the sky deck of the Willis (Sears) Tower. 22. Visit where the World Trade Centers were. 23. Reach a 80% healthy eating percentage steadily! 24. Pay off my debts to improve my credit score. 25. Build up credit otherwise. 26. Make a livable income from my new business. 27. Reach a 10 or less minute mile while running. 28. Work up to 10lb dumbbells for my strength training. 29. Do a book tour, probably self funded. 30. Buy my own house (really dreaming here lol). Some of these are mere dreams. Some will almost definitely happen, others may be exceeded, and the rest may never happen… but it was fun constructing this list! It helps me to look forward to the future with my current goals and what is important to me! Posted on October 19, 2015 October 21, 2015 by Bonnie McConaughyPosted in be your best, Believe in yourself, birthday, Exercise, FitnessTagged 30 before 30 list, dreams, Exercise, Fitness, Healthy, Losing Weight, Weight Loss. Thank you! I do love running and races seem fun, to compete with myself. It’s incredibly fun! I hope you enjoy it as much as I did. I thought of a few more so I might add to this later and post 30 before 30 + bonuses lol. Me too. It was calling to me. I did it just for fun and hope to achieve a lot of those on my list, but it can work just as well as a serious goal list! Thank you! I don’t think your link is working, it takes me to an error page. I’m not totally sure lol. I’m planning to divide them up like 10 per year and make some plans to make them happen if possible. Some will have to be done later as I don’t have the funds yet but I will figure it out. I will probably be posting as I do some of these as well, at the very least the fitness ones! love this list! All doable goals with time, patience and dedication! It’s true, some are mere dreams but they CAN become reality with determination! Last year I never thought I would be able to do the tinkerbell race both financially and fitness wise. I really surprised myself, it was so random how the day after my first 10k I got a letter from my charity with my tickets! Lots of luck to those goals, and thanks for some inspiration!